Once the bastion of male clubland, the old-fashioned smoking room has received an unlikely make-over as a result of the indoor smoking ban. This has resulted in a rash of cosy, outdoor smoking areas where women are as welcome as men and no one falls asleep in their leather armchairs. Highlighting this trend is the new Cigar Room at one of London’s most stylish, luxury hotels, the May Fair, which officially opened earlier. “The May Fair Hotel transformed perceptions of five star luxury and made it accessible to a wide range of tastes – particularly those more interested in modern style, service and comfort than a restrictive set of rules from an imaginary bye-gone age,” comments hotel general Manager Anthony Lee. “Now we are doing the same thing for cigar enthusiasts. Part of the appeal of the May Fair’s Cigar Room lies in its unique, dramatic design. 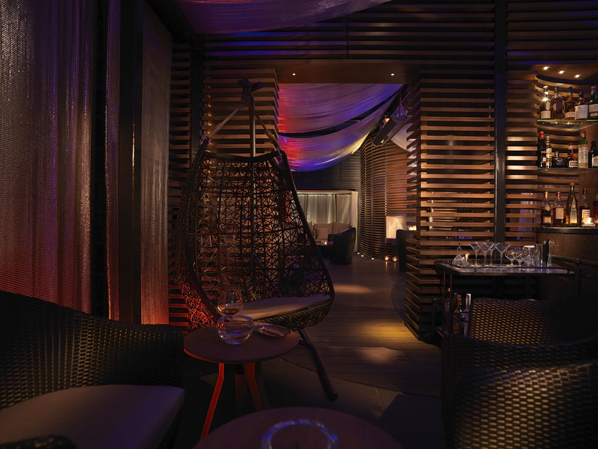 One of London’s leading cigar room designers, Graham Cox, along with The May Fair Hotel’s talented design team has created a visually stimulating environment which features swing chairs, day-beds, striking chain mail mesh walls and live fireplaces. The Cigar Room is on the first floor and beyond Silvena Rowe’s famous Quince Restaurant. For interested parties, the property is able to get around the smoking ban by having less than 50 per cent solid walls. Flowing fabric separates patrons from the elements on two sides, with designers measuring everything to the millimetre to balance the needs of the law and comfort. A fine cigar should be paired with a fine cognac, whisky, Rum or Tequila. The humidor houses forty varieties of cigar from heavyweight classics such as the Cuban Behike 52 Cohiba or the Montecristo Open Master as well as lighter, more feminine favourites such as Santa Domiana and Hoyo de Monterrey. To accompany them a range of the world’s finest Armagnacs, Cognacs and Whiskeys are joined by a selection of signature Martinis including the exclusive Rococo Chocolate Martini, available in “his” or “her” options, mixed using rich, single estate chocolate. Bottle lockers and individual humidors will also be available for guests with enough willpower to savour and save. A highlight is the Springbank 1968 Sherry Cask whisky – one of only three remaining bottles in the world – while, at £17,000 a bottle, the Voyage de Delamain Grande Champagne Cognac remains for only extremely special occasions. Tipped to be the most popular order is the Monte Cristo Daiquiri – Havana Rum, infused with the flavour of a Monte Cristo cigar, and fresh lime topped with La Perique Tobacco Liqueur. The Cigar Room’s Cigar Sommeliers (trained and certified by the exclusive suppliers of cuban cigars to the UK, Hunters & Frankau) exemplify the hotel’s ethos of making luxury experiences accessible. Led by Sophia Christoforidou, the Cigar Sommeliers will help select your cigar, match your cocktail or guide guests who are new to the experience, through the ritual of cigar smoking. For those looking to immerse themselves in the ritual of cigar tasting, or be the first to trial new brands and the latest releases, monthly master classes will also be available to book. “We have hunted far and wide to indulge our patrons with superior and exciting products,” explains lead Somellier Sophia Christoforidou.